The clinic is being held in Key Arena through Sunday. Service providers don't ask for identification or legal status, while organizers provide translators and free parking. Some Puget Sound residents spent the night at Seattle Center’s Fisher Pavilion to beat the crowds Thursday for free medical care at a makeshift clinic. 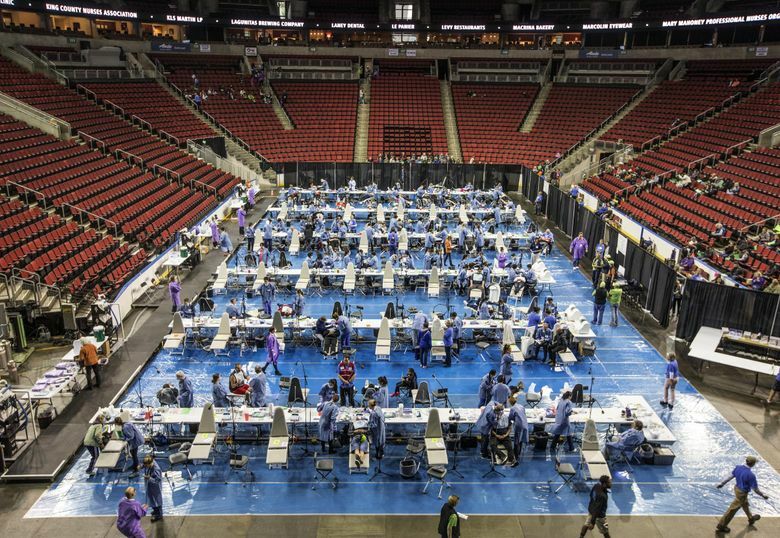 The clinic, set up inside Key Arena, started admitting patients at 6:30 a.m. Forty-five minutes later, it had already issued hundreds of admission tickets. 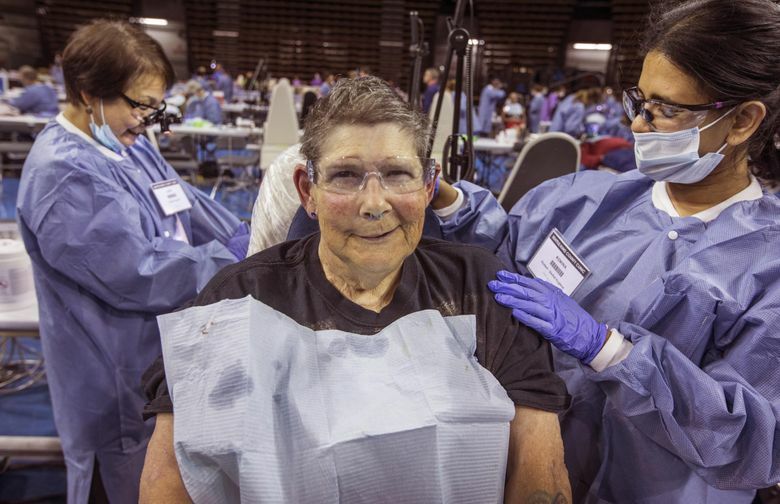 Volunteers and funding from 135 medical-services providers, businesses and nonprofits have made it possible for the four-day event to be held for a fifth year. Bronte Anderson, a 75-year-old retired nurse, was one of those waiting in line. She lives in low-income housing in Shoreline and came in on a public bus Wednesday at 7:30 p.m. to grab her ticket. She waited all night, but didn’t seem to mind. “I don’t begrudge that … Believe me, I’ll line up for free care anytime,” Anderson, said in a thick Scottish accent. She added that she gets “very little care” outside of what she receives at the clinic. Since the entirely free, first-come-first-served clinic started operations in 2014, almost 16,000 patients have received treatments worth an estimated $13.7 million, according to organizers. The patients include people whose statuses range from being homeless or having low income, to those with insufficient insurance coverage. This year it’s being held amid an intensifying national debate on health-care policy, with the Republican administration working to repeal the Affordable Care Act, while an increasing number of Democratic Party candidates running for federal office in the November midterms are doing so on platforms that include implementing a single-payer health-care system. 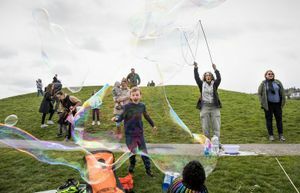 Although Key Arena was designed for sporting and entertainment events, it works surprisingly well as a hospital, said Deborah Daoust, a spokeswoman for Seattle Center. Patients are admitted and registered on the first floor of the arena, then escorted to “intake,” where nurses take their vital signs and determine the type of care they need. The court serves as a dental clinic, where 125 dental operatories, or chairs, are neatly lined up. A level above, the suites serve as different kinds of medical service stations. “We have several examination rooms and all kinds of services like chiropracty, a lot of diagnostic services like mammogram, ultrasound, EKG, and a whole spectrum of vision services,” Daoust said. Patients can be seen by dental, vision or other specialists, but can’t go to vision and dental on the same day because of time constraints, she said. Daoust said she was happy the city of Seattle was devoting resources to provide health services to the public, but having worked for the Canadian Consulate in the past, she finds it hard to ignore the reasons why the care is needed. 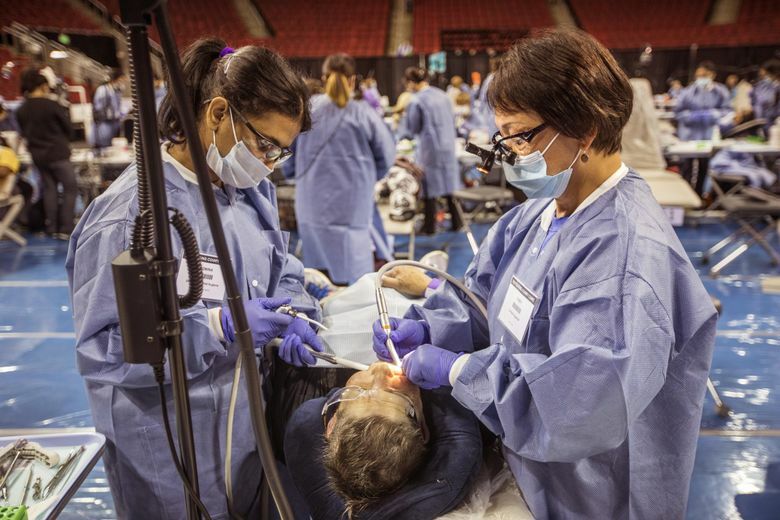 Out of 695 tickets that were handed out by 7:15 a.m. Thursday, 67 percent were for dental care, 30 percent for vision and the remainder were for other treatments. Service providers don’t ask for identification or legal status, and organizers provide translators and free parking. There’s dog sitting for service animals, and once patients are inside, other service animals are provided for anyone feeling anxious. While waiting to get a tooth filled, Anderson told the story of her visit to the same free clinic last year, when dentists were able to detect cancer on her tongue. It was diagnosed early enough to be easily removed by a specialist, an operation that left her speaking with a slight lisp even a year later.